What is a Pacific Razor Clam? The Pacific razor clam, Siliqua patula, is a large species of edible marine bivalve that grows to about 6 inches in Washington State and somewhat larger in Alaska. Razor clams were an important food source for Native American Northwest coastal tribes as well as early settlers. Around 1900 an entrepreneur living near the Columbia River discovered a superior way to can razor clams and launched a clam canning industry. Soon, every hamlet near a razor clam beach had a cannery, or several. Commercial diggers supplied the clams using special narrow-bladed shovels (the “clam gun”), and putting the clams into surf sacks harnessed to their bodies. They gathered hundreds of pounds of clams every low tide. After WWII, the razor clam canning industry petered out, but the personal use fishery, aka the recreational fishery, continued to thrive. Today, thousands flock to the sandy coastal beaches annually to enjoy razor clamming. It is a family-centric activity that attracts people of all genders and ages, from 8 to 80. 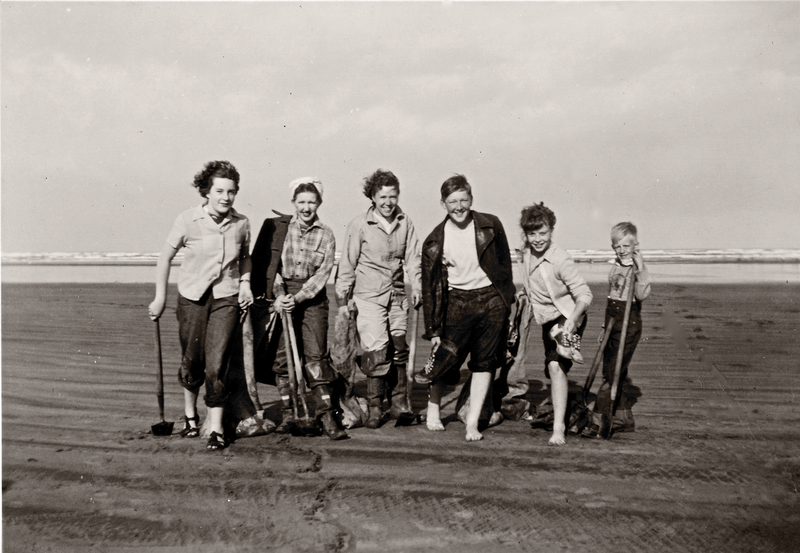 They use shovels and razor clam tubes, a tool invented by James Batstone, a Washingtonian, in 1957. 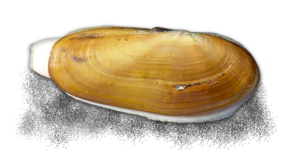 Quite a few consider razor clamming their favorite outdoor pursuit. 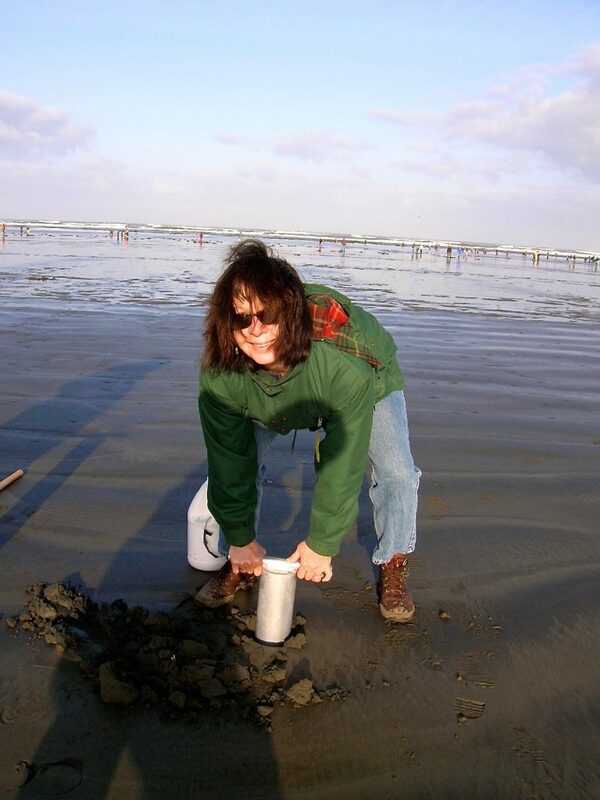 A happy razor clammer using a tube to hoist a column of sand and hopefully a clam. Photo credit David Berger. Washington has two razor clam festivals, one at the city of Ocean Shores, the other at the city of Long Beach, reflecting the clam’s role in the state’s identity and self-image. The shell is oblong and streamlined with a golden-brown, glossy color. 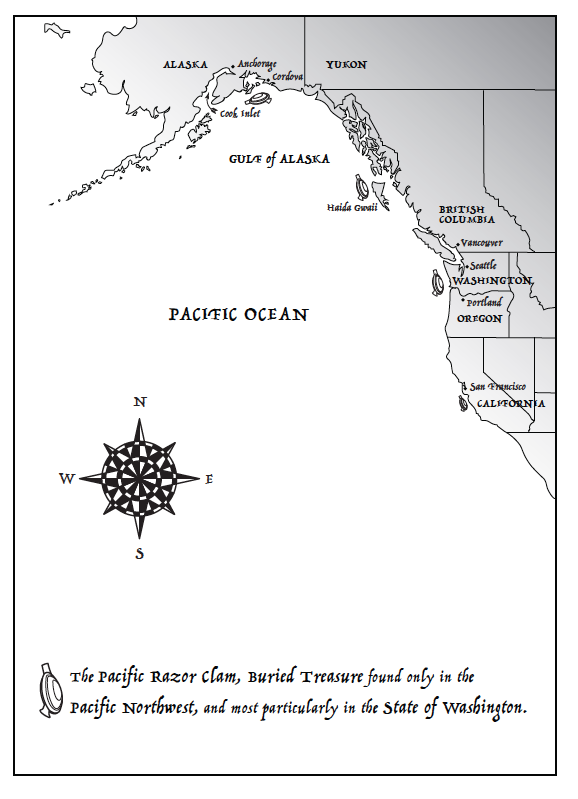 Author David Berger calls it “an Art Deco masterpiece” in his book, Razor Clams: Buried Treasure of the Pacific Northwest. The animal grows to the length of a hand, and is notable for its powerful foot that enables it to move up and down in the sand column with comparable rapidity– “a thoroughbred of the sand,” in Berger’s words. Washington has more than 53 miles of prime razor clam habitat along its coast. The clam can be found anywhere in these beaches from just below the surface to as deep as three or four feet. The razor clam is prized as a seafood delicacy and is a significant part of Washington’s culinary heritage. The Northwest is famous for providing many kinds of shellfish, but most of these are farm-raised. Pacific razor clams, by contrast, are only available as a wild food. Foragers must grab a shovel or tube, go to the beach at low tide, and face the elements, which is partly why the clams are only occasionally available at the seafood counter or restaurants. The razor clam is justly iconic for its role in the state’s history, culture and economy, and well deserves becoming the official state clam. Washington has more than 53 miles of prime razor clam habitat. The razor clam can dig down as fast as nine inches a minute in soft sand. The City of Ocean Shores had an 800-pound wooden razor clam sculpture in the 1960s. It was stolen in 1971 and never recovered. 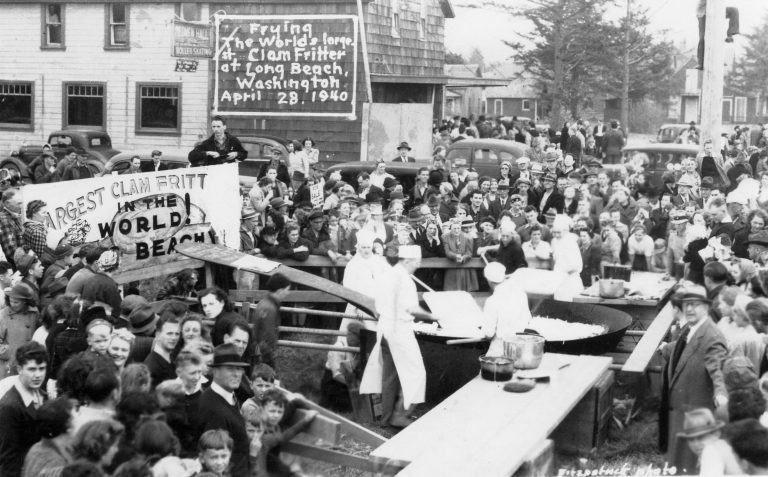 The original Long Beach razor clam festival in 1940 featured the world’s largest clam fritter made in a giant skillet. The fritter required two hundred pounds of razor clam meat and twenty dozen eggs. Courtesy Pacific Shellfish Ephemera/Matt Winters digital collection.